In this construction video tutorial, you will learn the definition of reinforcement checklist and advantages of checklist. Besides, you will learn how to examine steel reinforcement at construction site. Various types of checking should be performed throughout construction to produce a correct RCC member according to design. * The Formwork is arranged perfectly. * The inside face of formwork is smooth (for wooden formwork). * The formwork has good water-resistance capacity. * Supports are arranged and set perfectly. 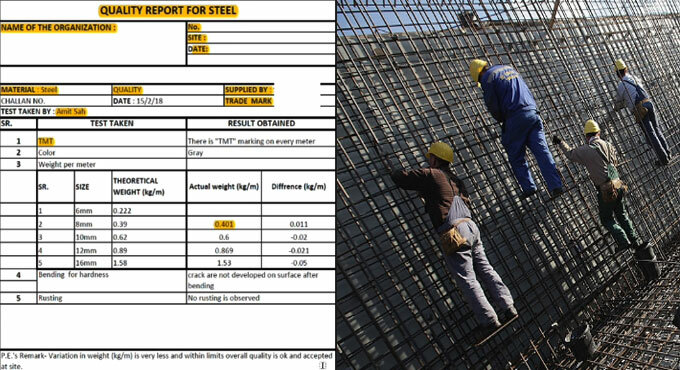 * Ensure width and depth/height of formwork is proper. * Make sure thin metal sheets are arranged along joints of wooden formwork. * Check foam is provided along the joint of steel formwork. * Steel is arranged by adhering to drawing. * The diameter of rebar is perfect. * Spanning of rebar is maintained properly. * Hooks and bends are arranged as per instructions of the structural designer. * The lap length is perfect. * Maintain proper clear cover. * Ensure the numbers of cover blocks are adequate. * Rebars do not contain rust. * The rebars should be free from crack. * There should be minimum 1 inch clear distance among two bars. * The rods are affixed perfect through binding wire. Watch the following video for online demonstration.